The Ministry of Food and Drug Safety Thursday dispelled the misconception of heat-not-burn cigarettes being healthier than ordinary cigarettes, publishing the results of an independent study done in Korea. The Ministry of Food and Drug Safety published study findings on heat-not-burn cigarettes that found them not less harmful than ordinary tobacco. Heat-not-burn cigarettes, which the public has often perceived as being less harmful to health than ordinary tobacco, were found to have more tar than the latter, and have the same nicotine content, the ministry said. “There were no evidence to show heat-not-burn cigarettes to be less harmful than ordinary cigarettes,” it added. 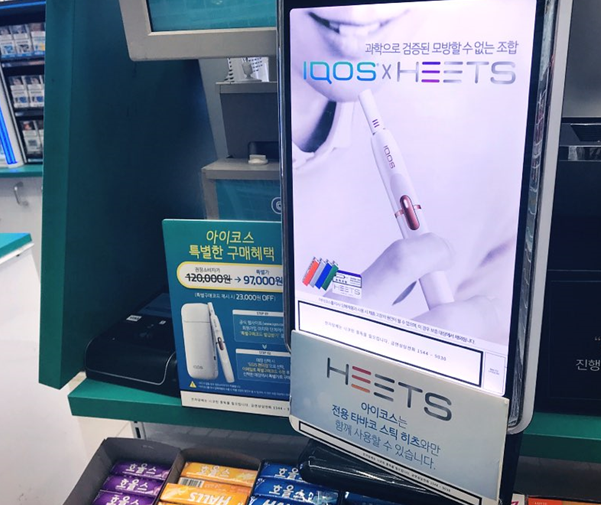 The study, aimed to provide correct information about heat-not-burn cigarettes substances for the public, screened six carcinogens and 11 other harmful substances, including nicotine and tar, excreted from 3 heat-not-burn cigarettes on the Korean market -- Philip Morris’s IQOS, British American Tobacco’s Glo and KT&G’s Lil. Researchers used the standards of the International Organization for Standardization and the method employed by Health Canada and had results verified by an independent evaluation committee composed of 11 professors, the ministry said. Findings showed heat-not-burn cigarettes had up to five human carcinogens, including benzopyrene and benzene. The ministry pointed out that heat-not-burn cigarettes, like ordinary tobacco, can cause various illnesses, such as cancer. Heat-not-burn cigarettes also had similar levels of nicotine as conventional products while two brands of e-cigs had higher tar content. Philip Morris’ iQOS had the highest nicotine and tar levels out of the three, the ministry noted. “The tar content of two heat-not-burn cigarettes was higher than ordinary tobacco, which indicates they could have other harmful substances not found in the latter,” it said. The ministry also said heat-not-burn cigarettes do not help people quit smoking as nicotine is an addictive substance. The overall harmfulness of e-cigs additionally depends on factors such as duration and amount of smoking, inhaling amount and depth as well as other smoking habits, it said.